This top of the range cycle carrier stands in a class of its own with regards to ease of use, build quality and finish. The aluminium design gives a classy first impression and combine this with its strong and rigid design, the ‘Cykell’ range of carriers is set to make a huge impact on the UK market. 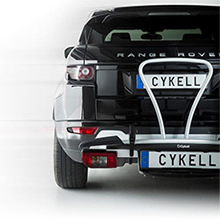 Suitable for use on standard bikes as well as electric bikes, the ‘Cykell’ cycle carrier comes in two bike and three bike options. Furthermore, should at any point you need to increase the capacity of your carrier, an upgrade to carry an extra bike is available for purchase thus converting your previous 2 bike into a 3, and likewise your 3 into a 4. Described as the ‘Just Click’ cycle rack, this carrier is as easy to use as they come. Furthermore, the lightweight structure makes it ideal for use by all as it enables easy attachment to and from your vehicle, as well as being lockable via key. A unique feature this product incorporates is its ability to be wheeled to and from your vehicle, making light work of what can sometimes be an arduous task to then store your carrier once removed.